Previous PostDog park, trail, greenbelt on NBHC meeting agendaNext PostBeacon Hill: coyote country? I thought the food was good but not worth the 40 minute wait. I agree with the review that it seemed the hostess just wanted us to go away. The vegetarian options were minimal and uninspired, and the margherita pizza kinda bland. I wasn’t super impressed with the sauce. My friends said they enjoyed the appetizers more than their (meat) pizza, but since most of those had meat I didn’t try. I will try again in 4-6 months when the buzz has died down, but unless they have more veggie options I probably won’t go a third time. Every time we’ve tried to go there, we’ve been informed that it’s a wait of “at least an hour”, which indicates either extreme popularity or extreme preciousness. Either way, that’s a deal breaker for me. I’d rather wait at home for Dominos or Pizza Hut. You can gas on all you want about fire-baked or organic or whatever, but at the end of the day pizza really is just pizza. With that said, and in all honesty, good luck to them. It’s nice to have something on the avenue that’s not a hair salon, dentist office or gas station. We love this place. Have been there twice, and most recently enjoyed much of the menu discussed in The Stranger piece. Interesting comment they had about the host. So far my only rub seems to be some of the wait staff are teething. We are patient, and expect things will get better as things settle down some. But nobody working has been outright rude or unpleasant – quite the contrary. Jerry did coyly slide over to deliver our funghi to the table. If it weren’t so busy, I would have loved to chat him up a bit. And offer my congratulations on a job well done pulling over that overhaul. You pretty much summed up why this place isn’t for you. Stay at home, friend. Only been once because the combination of wait and child can be problematic, but it was some of the best pizza I’ve ever had. If you’d rather wait at home for Dominos because “pizza really is just pizza” then don’t bother going to Bar del Corso because you won’t think what they serve is pizza. I love this feedback! I am thrilled to see that the wait appears to be deterring 1) vegetarians, 2) people who think Domino’s and Bar Del Corso are even in the same food group, and 3) people with children! This will make the experience that much better for those of us who like to avoid groups 1-3! 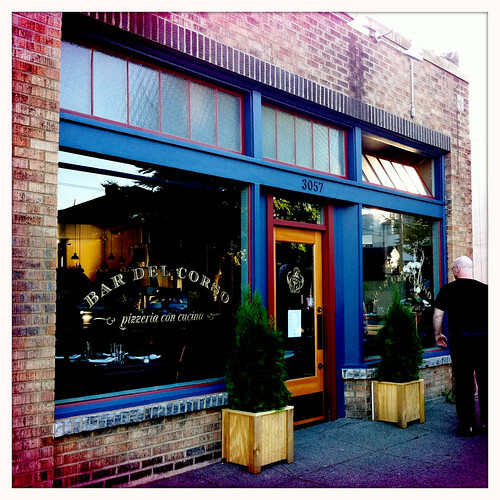 Bar Del Corso is fabulous for any neighborhood and particularly Beacon Hill. We have been there a dozen times and will go hundreds more. God bless Jerry and team and I will be back! Soon! Not all people with children are bad dining companions. Some of them even invested in Bar del Corso so you could go there a dozen times, Taggart. Taggart, you wouldn’t even know my kid was in the restaurant. And that’s the only polite thing I have to say to you or anyone else who wishes their parents didn’t take them to restaurants when they were kids. Maybe they didn’t and that’s the problem. I think that kid-friendly vs adults-only discussions can get out of hand, not just here on Beacon Hill. There are reasons to understand both sides. Pro kid: We were all kids once. Going out to eat is a good way for kids to try new food experiences, and to learn how to behave/socialize in public. And it’s a nice way for a family to spend some time together and give Mom and Dad a break from cooking. Pro adults: We adults work hard for our money and when we go out to spend money on dinner, we want to have a nice dining experience without hearing kids screaming or having them run into us. Taking the restaurant into account: Owners want to please their clientele, which is made up of both sides, and they want their staff to be able to do their job safely. I am sure the owners of Bar del Corso love the kids AND the adults. It seems like the early side of the night (5-6:30) is a good time for kids, with the later hours good for adults. Yikes. I guess I touched a nerve. Apparently preciousness (and touchiness) isn’t limited to pizzerias. No wonder people are so hesitant to post on this site. The little clique of commenters is worse than high school. Good thing the city underwrites this thing. Like I said, I really do hope the place does well. The neighborhood needs it. As for me, If I want to wait an hour for a slice of expensive pizza, I’ll go to Seatac. Just so you know, the city does not underwrite this blog in any way, shape, or fashion. It is independently operated — by me. It is probably the domain name that made you think the city sponsors it, but you should probably know that “seattle.wa.us” domains are not government-operated or owned or sponsored. See http://www.who.is/whois/seattle.wa.us/ for information about who owns the domain. ci.seattle.wa.us is the city of Seattle, but we are not at that address. Thanks for the correction. Maybe someday I’ll be sophisticated enough to fit in. In the meantime, by all means continue your argument about who’s children are well-behaved enough to go to the pizza place. I should also clarify that the blog is not associated with the folks at NW Nexus who maintain the seattle.wa.us domain. We just have a subdomain through them. Back on topic… I have to say I was pleasantly surprised by the prices. Despite the fancy-pants foreign sounding names and the added expense of adequate lighting it doesn’t have the downtown prices I expected. I love that the folks who own Bar del Corso live in the neighborhood–extra bonus reason for going there. The food is outstanding & reasonably priced for how very good it is. The space is lovely. The wait time means that (at least this time of year) people will be wandering around the neighborhood, seeing what else there is to offer. Staff was friendly while we were there–even to our happy, well-behaved toddler who enjoyed her pizza. I’m not sure how a place that generally allows open expression to anyone counts as a “clique.” For what it’s worth I started my response about Dominos before the one before it was posted, but I got distracted and it took a while to finish. If I’d seen the point was already made I wouldn’t have bothered. The piling on was unintentional. i went with my mother and brother (we walked there) and honestly I thought the pizza wasn’t anything to cry home about, the sides such as appetizers and Salads and desserts portions I also thought were tad small (but they were ALOT better then the Pizza.) the waitress seemed a bit short with us also but i will chalk that up to it being a new restaurant. I probably will not go back there, as our position near the VA hospital makes it actually practical to walk to Tutta Bella’s in Columbia city, it is a about a half hour walk to either place. (hell i have walked to Piecorras on capital hill before and that place blows them both out of the water.